I've had these boots about 2 years now. I think they're finally broken in! These are some serious boots, not for the average weekend warrior. First off, though, pull out the cheesy insole that comes with the boots (boot manufacturers never spend the extra $$ to make a good torque-resistant insole)and put in a Superfeet hiking insole. I usually wear my Ridgelines on extended backpacking trips when I'm carrying a 50+ pack, usually on some pretty tough (steep and/or rocky terrain). And I've never had any soreness in my feet, back or ankles. I have weak ankles, but haven't had any problem w/ them since I started wearing Ridgelines. Probably one of my favorite features is that the Vibram sole sticks like glue, even when boulder hopping on wet rock surfaces. With an application of Nikwax every six months or so, these boots are 100% waterproof, even in the very rainy area I live in and in snow. I've even worn these boots with snowshoes, and although heavy, they were comfortable, warm & dry. Some things you'll need to get used to. The single piece of leather construction (that makes them so waterproof) also means that the tongue is very thick and hard to manipulate. The D-rings are hard on laces, and are difficult to lace up. The good thing is that once you get the laces just the way you want them, they won't slip loose. The boots weigh a lot, so you're gonna have some heel slippage just because of the sheer weight. But they fit extremely well (I have narrow feet), and with proper lacing, the slippage isn't enough to be very noticeable, and has never caused me blisters. Ok, these aren't the best looking boots,especially for us girls, but then again, other than a few fashion-conscious bears, who cares? These are my first Merrell boots and I shopped for the Ridgeline specific. I must say this boot suprised me in several ways. First, they are very light, almost like wearing nothing at all. Second, they are very waterproof but at a cost, it gets warm/hot inside after a while. Third, the Vibram material sticks well to dry surfaces. So I will get right to it, these are kick a## boots on DRY SURFACE. If you do any creek or river trails be ready to slip frequently. Slick logs, non-porous wet rock or anything with algae will pose problems. I really expected more from these boots. I have decided that these will be dry surface boots for me. My advice, buy something with Gore-tex and consider other sole options. I don't want to shoot down the Vibram, because I can't say if it's that or just the Ridgeline's tread pattern. These things are awesome!!! I just finished a 2 month trip in the Yukon, and my feet were dry and happy the whole time. Great ankle support, as I weigh 220 lbs and had a 70 odd pound pack. These are the best feeling/fitting boots I've worn in years. Problems? The soles seem to be wearing quickly, as they are only 6 mo. old and will need resoling soon. Also, the D ring lace-ups eat shoelaces. This has been fixed, though, in 99 with a ball bearing lace up system. Try em. You'll love em. I have rather narrow feet and these boots fit GREAT! I have rather narrow feet and these boots fit GREAT! The lacing to the toes is probable what helped. I have had them for 3 months now and used them for a week long hike in the Rockies. These have turned out to be the best boots I have ever purchased. If I were to change anything, it would be the D-rings. Wow!!! I tried every damn boot there is and finally found the right boot. After many miles, I'm retiring my Vasque Summits because these Merrels rock! They took a while to break in and the toe chop... Holy crap!!! But worth the suffering and then some. 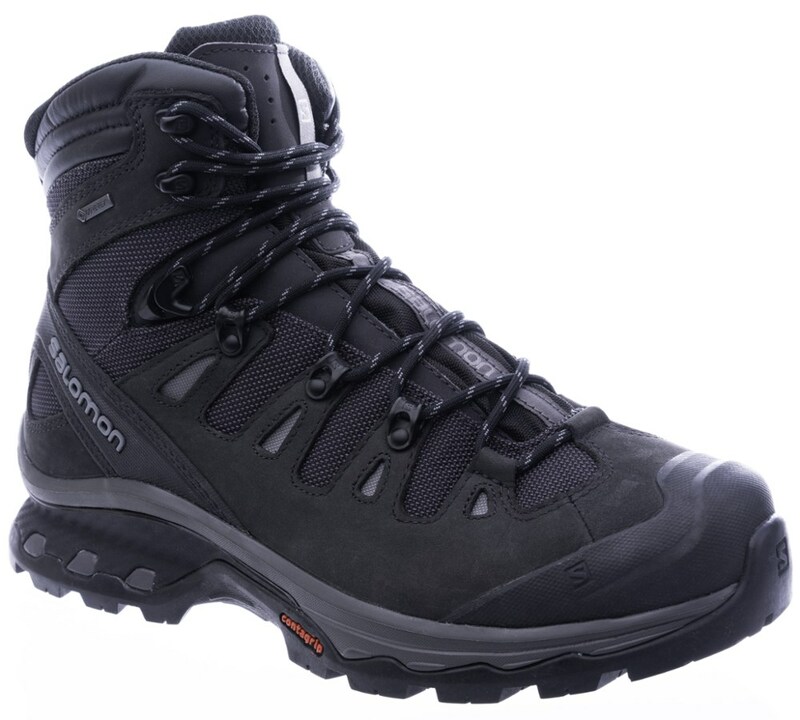 Great support, stability, weatherproofing, comfort and not bad traction. They are not as heavy as they look, but they are definately best for serious backpacking. They don't look as good as Solomon Mountain Guides, but they are anything but ugly (as if anyone cares). My only gripe is the D-ring lacing system. They go through laces faster than Clinton through women. And good luck getting them real tight (the laces) during the break-in period. Use the lace puller on your Swiss Army knife and bring some extra laces and these will be the best boots you will ever own. There is even a more beefy, stiffer model available, for more mountainous uses( and psychos). The Merrell Ridgeline is not available from the stores we monitor. It was last seen October 5, 2012	at Backcountry.com.